At last some time at home. We have got new video cameras on order which sould be here soon. Sony's very latest model. First batch that arrives in the country apparantly. Moving up to High Def. for filming doesn't come without problems. Diff does most of our editing and has a smart new PC arriving tomorrow. What else is happening? The Sunday Times are running a feature and review of E11 this weekend. We have been busy preparing them an exclusive 4 minute edit of the film that we be hosted on their website. Aparantly it will be in the section next to Jeremy Clarkson 'On The Edge' or something similar sounding. Next week we have BBC Scotland coming to our offices to shoot a 6 minute news story that will air on The Adventure Show sometime in the new year. Fiona says that I better to some cleaning. Hmm, she has a point. I'm procrastinating at the moment with this blog stuff. Instead I should be finishing off my 'Mixed Messages' article for Climb Magazine but I'm not sure how to pitch it. The deadline was today which I've missed. At last I'm getting back into my training. This week has been busy at the Schoolyard with a lot of folks over to train and that always helps to give you the impetus to train hard. Tonight we set a lot of new routes. That's the most fun, a bit of competition is good in training, just makes you try that bit harder. The Ice World Cup is only 8 weeks away though and I feel miles away from where I need to be for it. Ok. Must buckle down to training properly now. No excuses. Diff hanging out between shots. 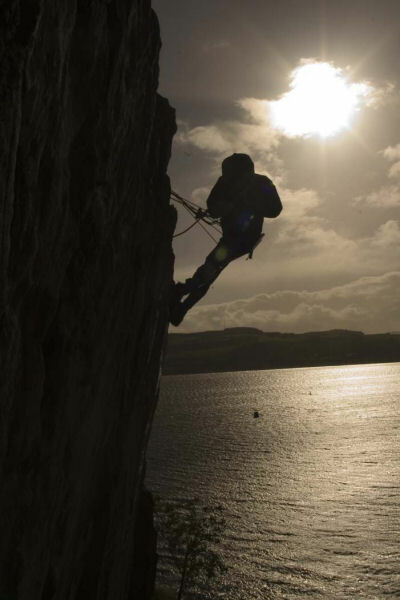 Scottish climbers Dave Redpath and Dave MacLeod were the main people we were out to film. 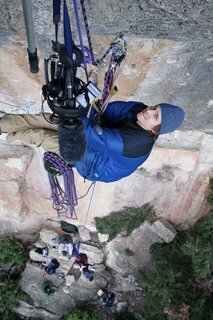 Other climbers in town included Chris Sharma, Dave Graham, Yuji Hirayama and Dani Andrada as well as the ever present Toni who is the guardian from the refuge. The Dave's were suffering from the heat and a bit of sun stroke - 3 months since the sun has shone in Scotland. 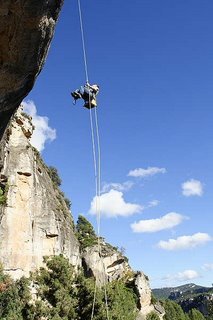 Redpath was focused on a cracking line, Anabolica, a steady 8a. 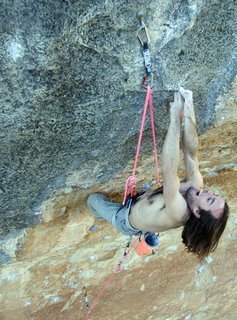 MacLeod was back for unfinished business on Lodi Social (sp) 8c+ as well as a look at El Muerte (Rich Simpson's 9a) and some other hard routes. 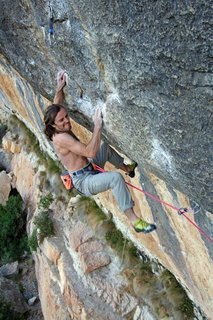 Sharma et al were occupied on La Rambla 9a+. 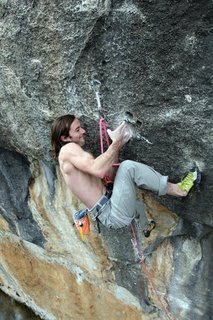 Dave MacLeod figured out a direct sequence on A Muerte f9a, avoiding the big reach left followed by big reach back right - instead a heinious looking 2 finger match, but it worked. Good progress and looking very possible. 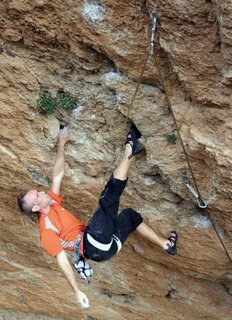 Dave MacLeod on Lodi Social (sp) f8c+. Very close but not this time. Over on La Rambla there were no ticks whilst we were there. Yuji was on his fourth visit foucused on the route and a huge number of redpoints. We watched some video that Toni shot that day. Yugi fell on the final crux. He's reached this point a countless times. It was nice to meet him. 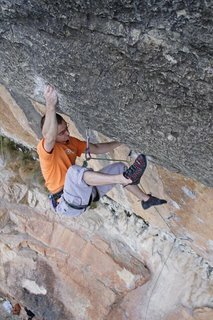 A very happy and humble guy, and a realy graceful climber. I hope he succeeds. When we left he had only 2 redpoint days left. I didn't really get to see the other guys climb which was a shame. Next time maybe. We'll be back later in January when the Scottish contingent might find temperatures more to their liking. We've just spend a mad month attending three film festivals (Edinburgh, Banff and Kendal)... that's a lot of partying... disguised as networking. We premiered E11 at Edinburgh, that was a excellent night, the crowd was really hyped up. It was great to see Dave & Claire MacLeod there with a lot of their friends and family. Stevie Christie, the director of the Festival, has done an awesome job building this event up over the last few years. It was amazing to be awarded ‘Best Film’, ‘Best Climbing Film’ and the ‘People Choice Award’ for E11. After Edinburgh we headed off to Banff, the world's biggest Mountain Film Festival. This is the 3rd year on the run that i've headed over to Banff with a film. Amazingly our first ever Film 'Fools with Tools' was excepted there back in 2004. Last year we were there with Cavewoman and of course this year we had E11. Banff is just an amazing experience, i'd recommend anyone to attend. Set in the beautiful Canadian rockies, the Banff festival brings you the best mountain films and speakers from across the world. I always come away from Banff inspired, both to explore this world and to make better films. Finally we headed to Kendal in the English Lake district. This is the biggest mountain festival in the UK and still seems to grow ever year. Kendal is the maddest of any festival i've ever attended. The Saturday night party is crazy... absolute madness. Although this year i was disappointed to see that the Police weren't called out. We also came away with a gong, Judges Special Award, a trophy sculptured by Andy Parkins and a cheque that should cover most of our bar bill. So as the last hangover from a festival has cleared, it now feels like time to move on from E11 and start concentrating on our next film. We've already ordered new HD cameras and started to line up some talented athletes to film.